Hold your horses, you haven’t missed the big event yet! 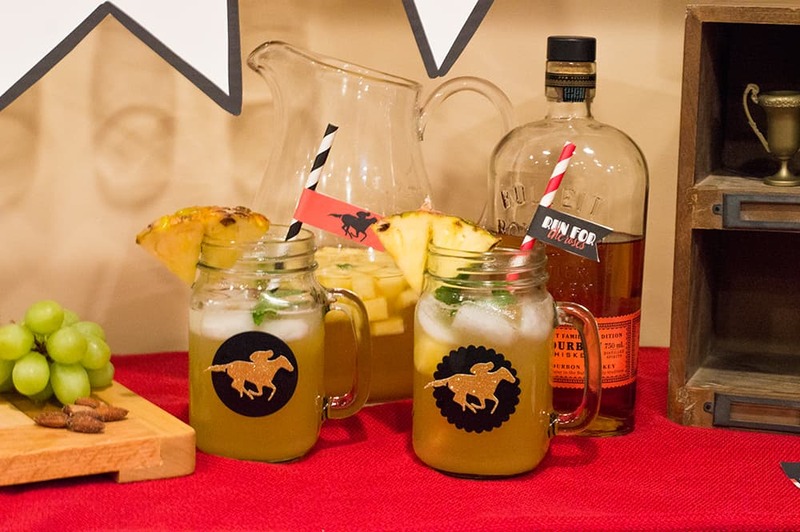 However, with the Kentucky Derby less than a week away, it’s time to make sure you have your Derby watching party style planned out. 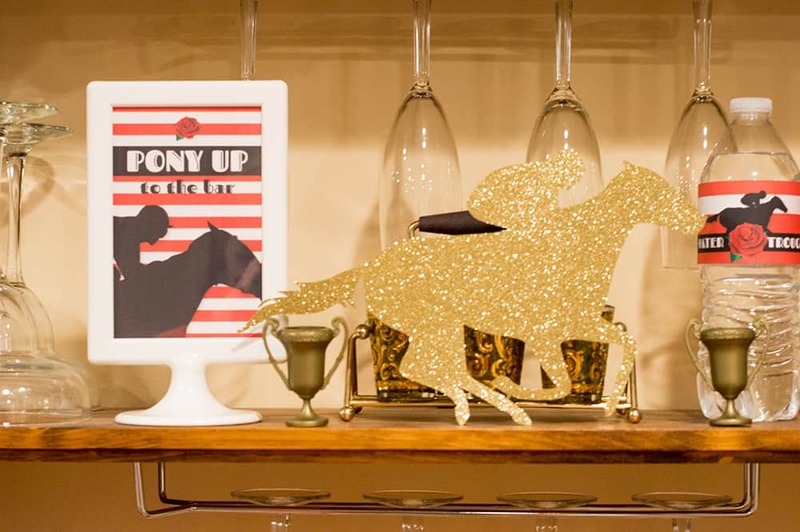 I’ve teamed up with Holly from Legally Crafty Blog to share a Derby dining table and bar setup that will be sure to wager a winner for your Kentucky Derby party. 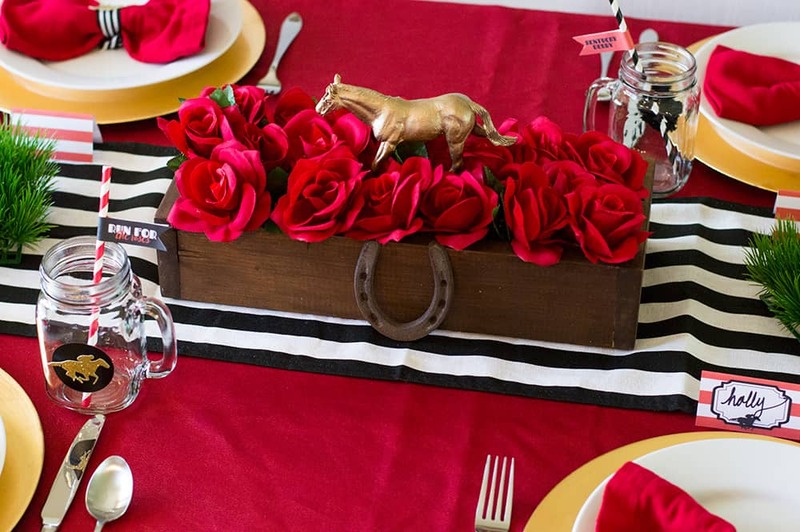 We decided to use the traditional color red, the primary color of roses, which is synonymous with the Kentucky Derby. Every year the winning horse is draped with a garland of more than 400 roses. 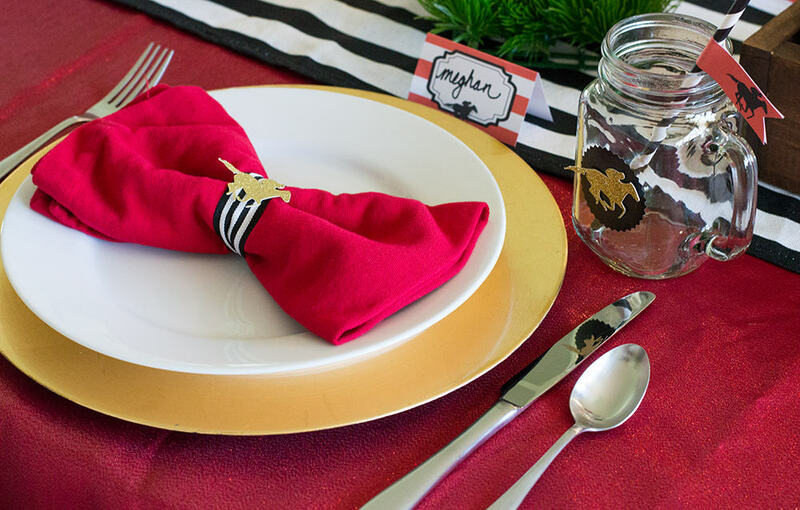 Using red, black, white, and pops of gold, our theme is elegant and easily styled with many items you probably already have around your home. 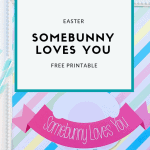 We are sharing all the sources and tutorials, including some free party printables. It can’t get easier than that! 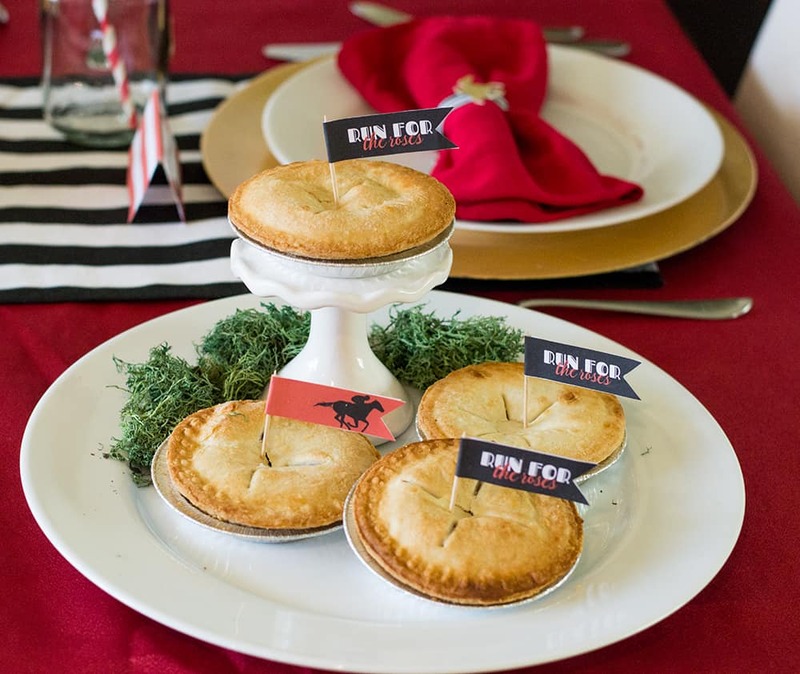 Serve an elegant and festive meal at your Kentucky Derby viewing party with these tips to style the perfect table. We put this table together pretty quickly. 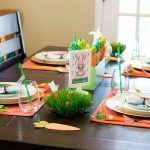 What took the longest was assembling the printables, so if you get started on those the day before, you are in good shape to put this all together the day of and be able to welcome your guests without any stress. Wood box for centerpiece – Oriental Trading has this one or this one. 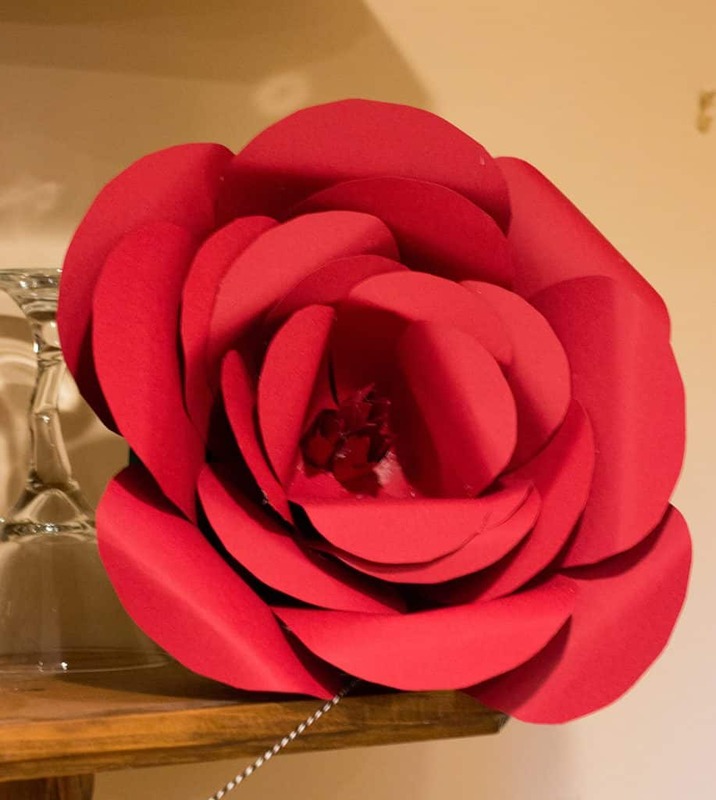 Faux roses (dollar store) or grab this faux rose bouquet from Amazon. Plastic horses (dollar store) or for some mini ones try these. Moss (dollar store) or order some from Oriental Trading. 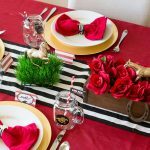 We started with a red sparkly table cloth and layered on the black and white striped table runner , which I know will get a lot of use. Black and white stripes are a versatile look, and I am already thinking about how to use this runner again. I’m sure you’ll see it again soon! For the place settings, we opted for gold chargers and white plates. The gold gives a pop of glitz and glamour, and white plates are traditional and elegant and don’t take away from the pièce de résistance: the delightful centerpieces. 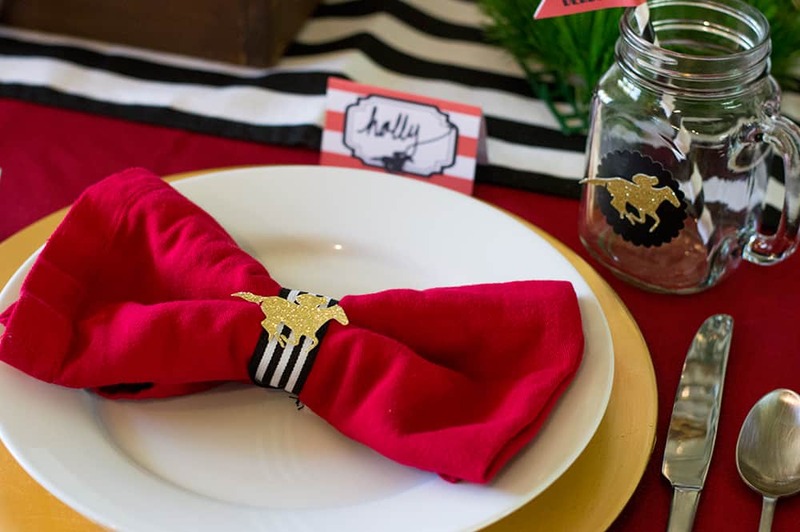 Holly had some red napkins and was able to dig out those black and white ribbons that she used in a past party to tie up napkins. 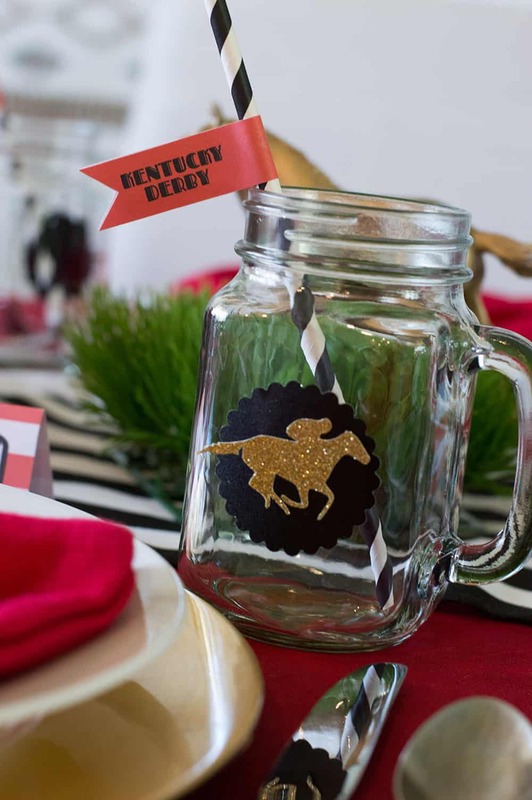 I used my Silhouette Cameo to cut out the horse in glitter card stock, which added some elegant and fun flair to the party. We used them on the napkins and on the glasses. 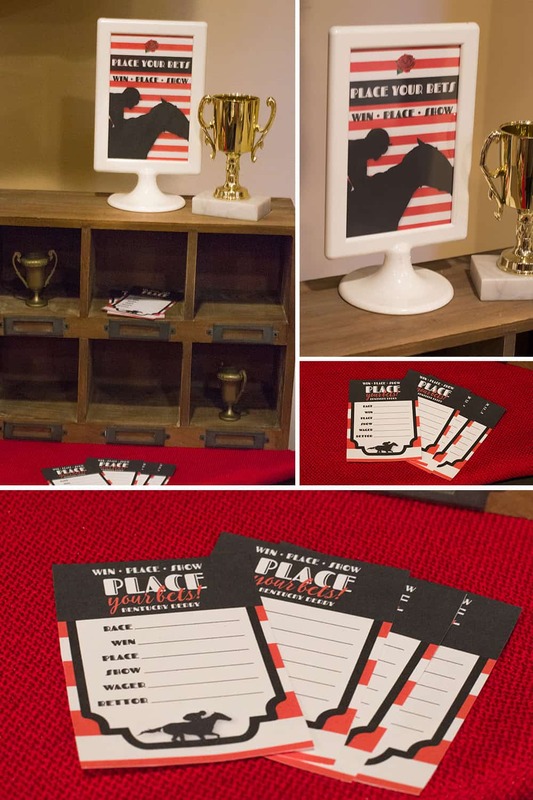 The place cards bring a sense of formality, inviting each guest to their seat. I love the Southern feel that the mason jars bring. I bought these at a consignment bridal store for the Lumberjack Minnesota First Birthday party and love when I get to bring them out for events, since reusing party decorations is one of my greatest achievements, lol! 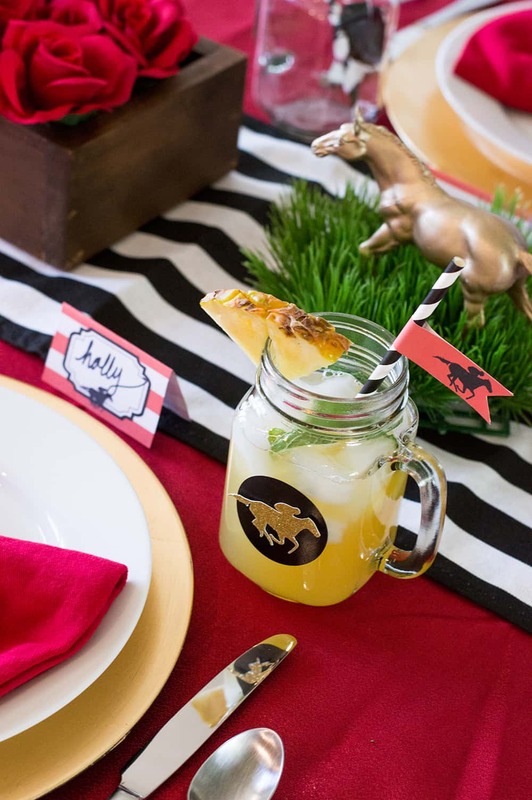 Of course we add straw flags to some black and white straws , one of my favorite party printables to include in my parties. Every table needs a main focal point, and this centerpiece is sure to grab attention. Holly has the tutorial to create the main centerpiece item over on her blog. 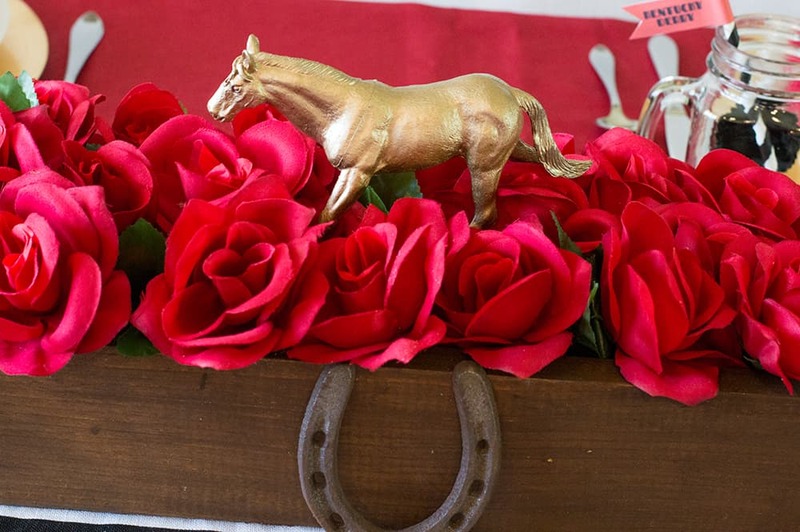 In short, she stained a wood box, added dollar store faux roses, spray painted a Dollar Tree horse with gold, and topped it off with a rustic horse shoe, to create a stunning arrangement for the center of our Kentucky Derby tablescape. 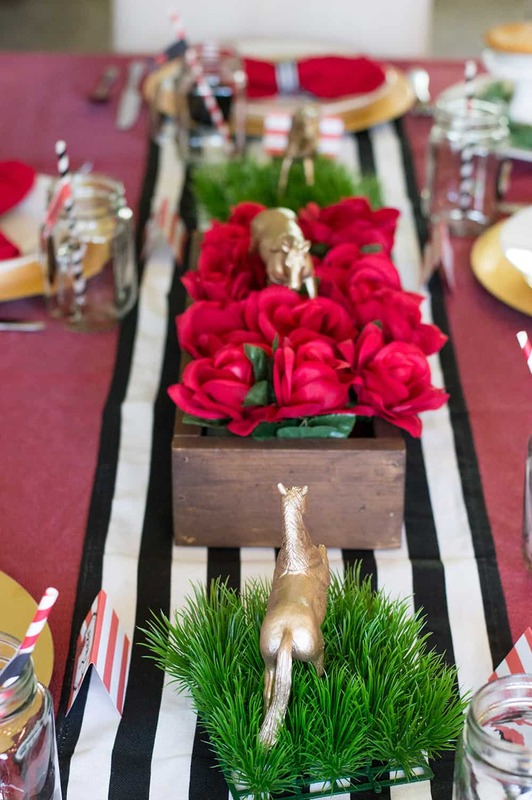 We then used some grass mats, which I used for my Carrot Patch Easter Table, and added more gold spray painted, dollar store horses. I love how they are out to pasture! 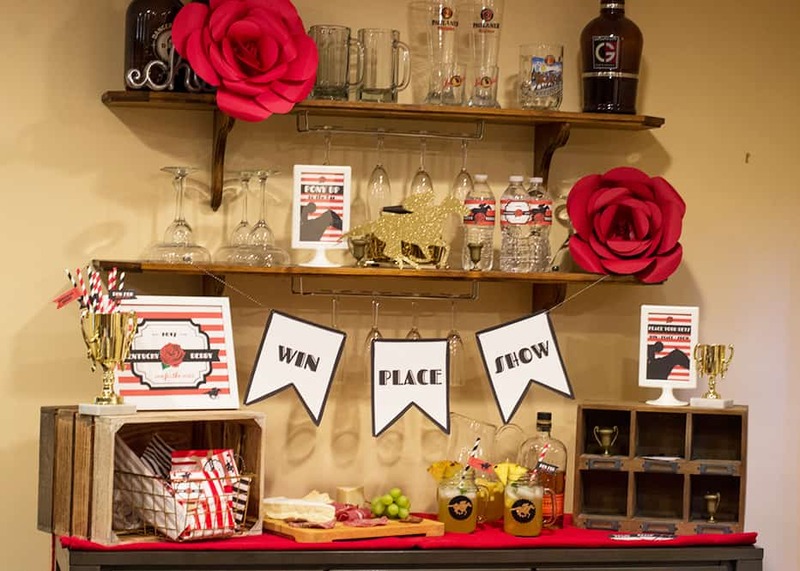 Holly has an amazing bar setup in her basement that she styles quite frequently for events. 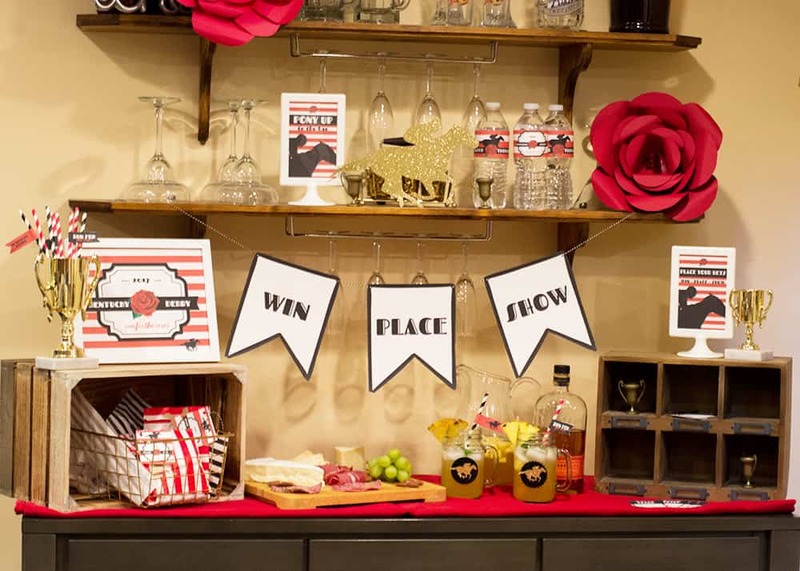 You might remember the March Madness party printables I created and the bar Holly styled with them. It was only fitting that we take over that space for the Kentucky Derby party. I have never made paper flowers before, but was excited to try it for this event. I followed these tutorials from The Craft Patch and The SITS girls and managed to figure it out! It was definitely a process, but I’m sure if I make them again it will get easier as I become more comfortable with it. I made two flowers that we tucked into the bar. Here’s a close-up, though the photo turned out a little grainy. Besides the drinks, the bar included the main activity: the betting. What’s a Kentucky Derby without wagering who is going to win? 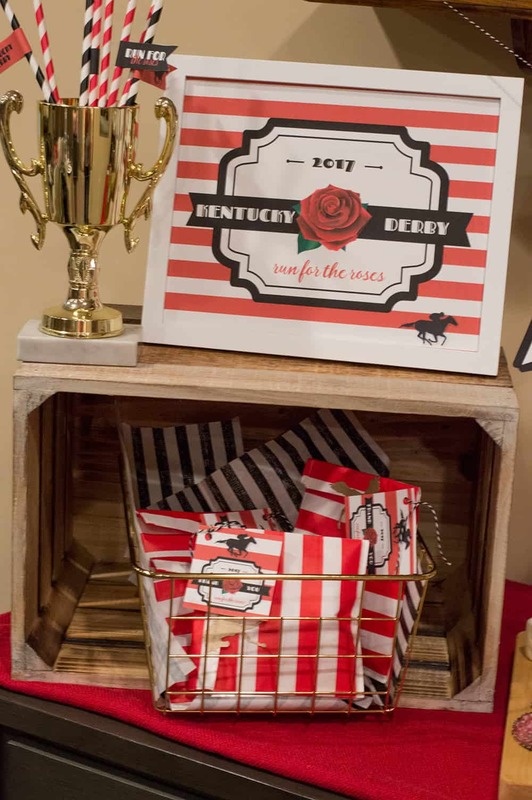 These betting slips make it so easy and fun for your guests to fill out and bet Win, Place, or Show for all of the Kentucky Derby events. Holly had this cute little cubby console on hand, that was perfect for this use. We filled up the empty spaces with mini trophies picked up from the dollar store. 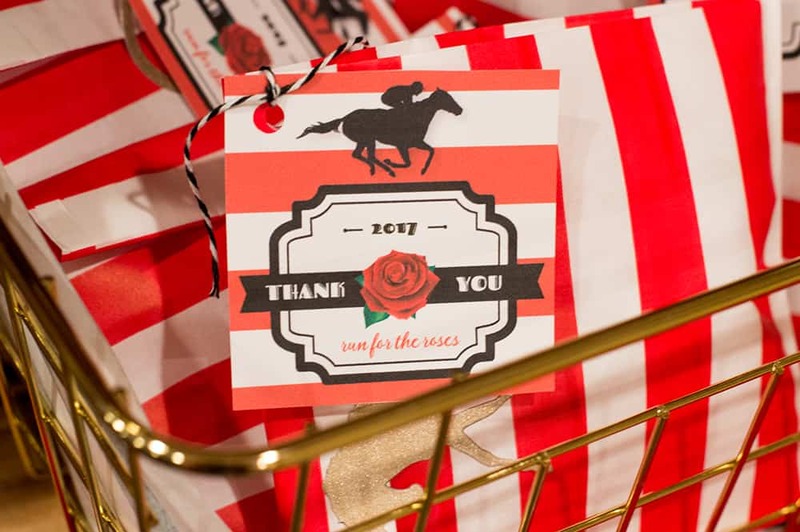 We also put together a some favors, and packaged them up in cute little red and white bags adorned with a Thank You tag. 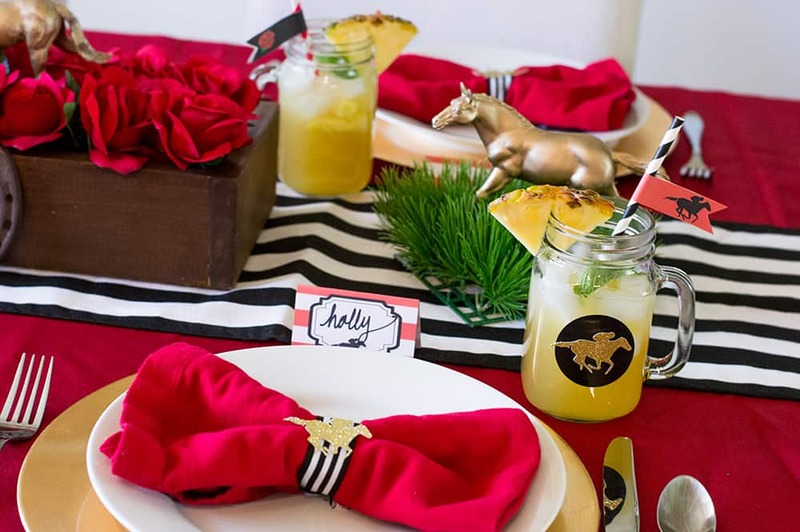 So now that you have your decorations on point for your Kentucky Derby party, you need to consider food and drinks. 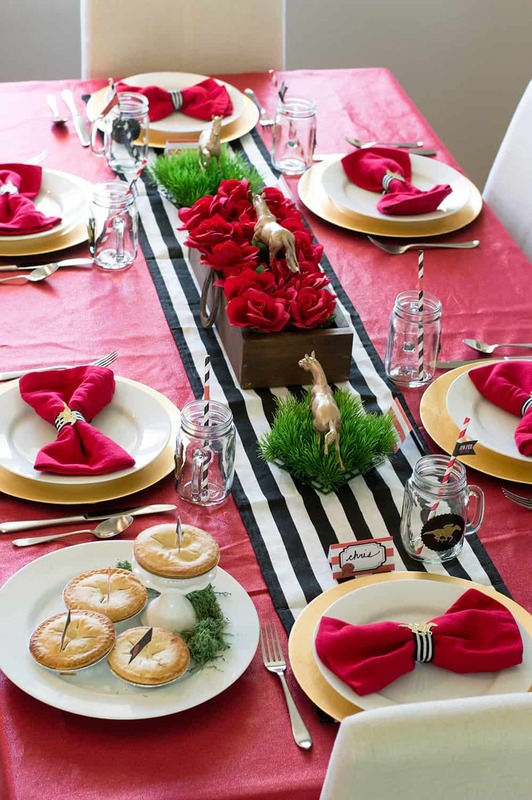 We are sharing three awesome ideas to satisfy your guests. 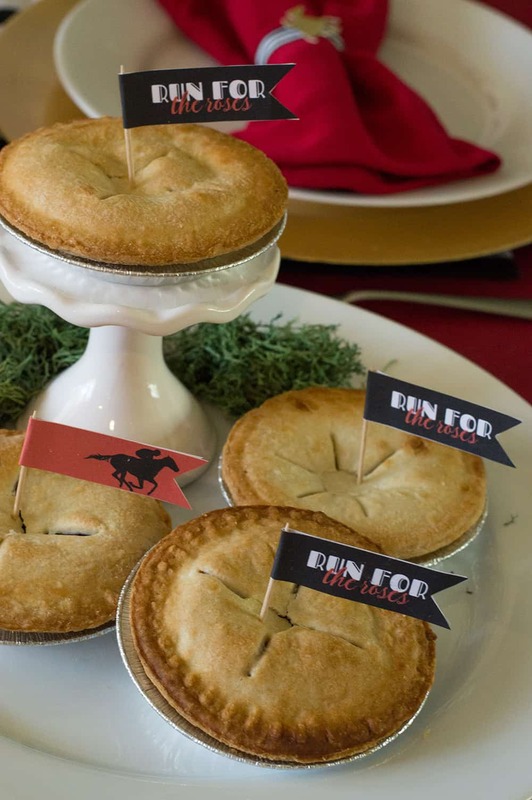 First, we opted to serve our guests mini pies. These were picked up at Walmart for $0.50 a piece. Seriously, 50 CENTS! They have a variety of flavors, such as apple, peach, cherry, blueberry, and pumpkin. We stuck to fruit flavors for our event. Aren’t these just darling? We stuck some of the straw flags that we attached to tooth picks, and added moss that we picked up from the dollar store. 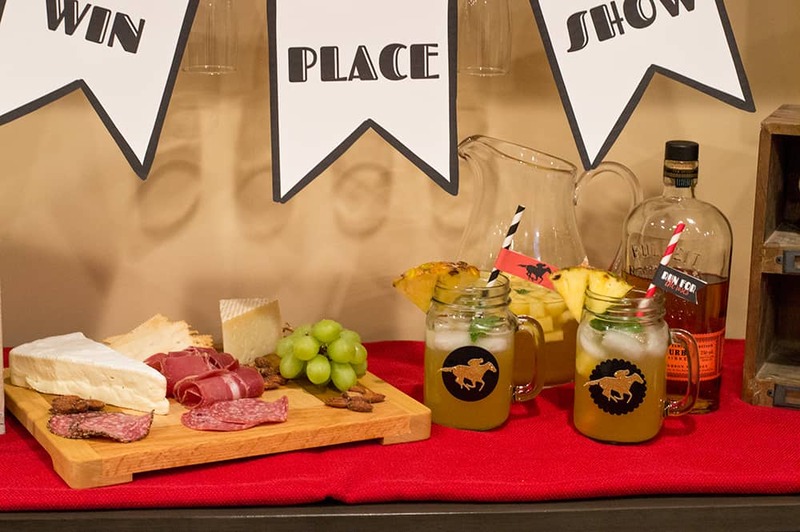 We encouraged our guests to Pony up to the bar for an amazing drink! 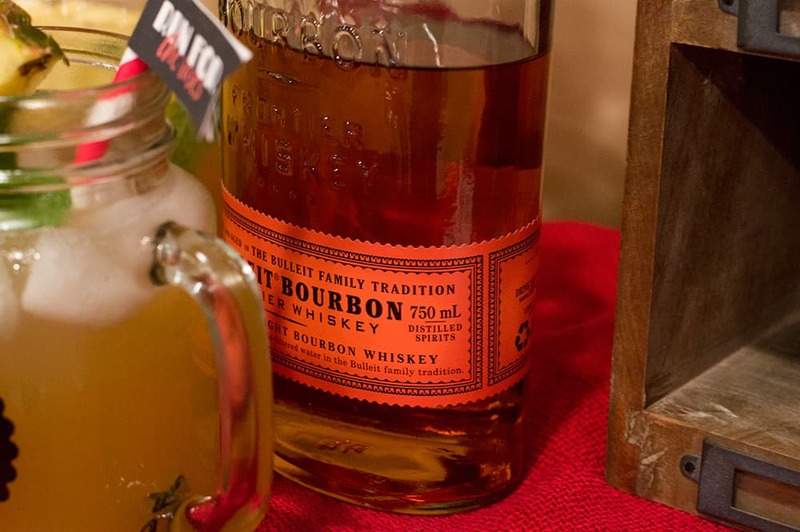 Mint Juleps are the must have drink to include at your gathering. I have to be honest, though, I’m not a fan of the traditional recipe. 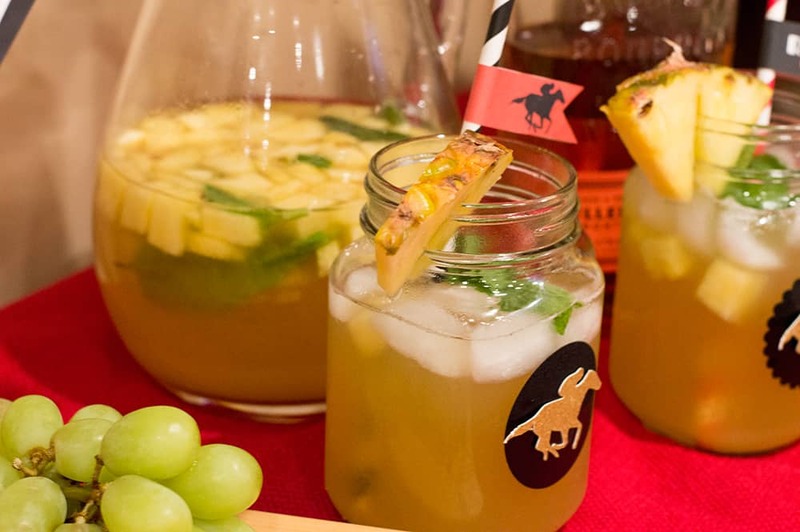 But alas, Holly tracked down this Pinneapple Mint Julep Sangria from a Farmgirl’s Dabbles, a refreshing option that I loved! I will definitely be making these drinks again this Summer. Of course we used Kentucky Bourbon! Finally, having nibbles on hand for guests before (or even after your meal if the party lingers) is important, especially if you are imbibing on the bourbon drinks. 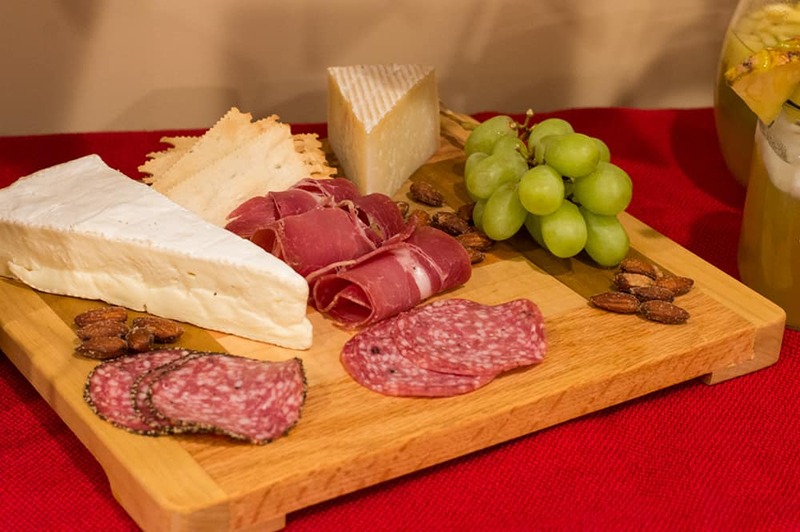 We put together a simple charcuterie tray that includes cheese, crackers, meats, nuts, and grapes. It can’t get easier than that. 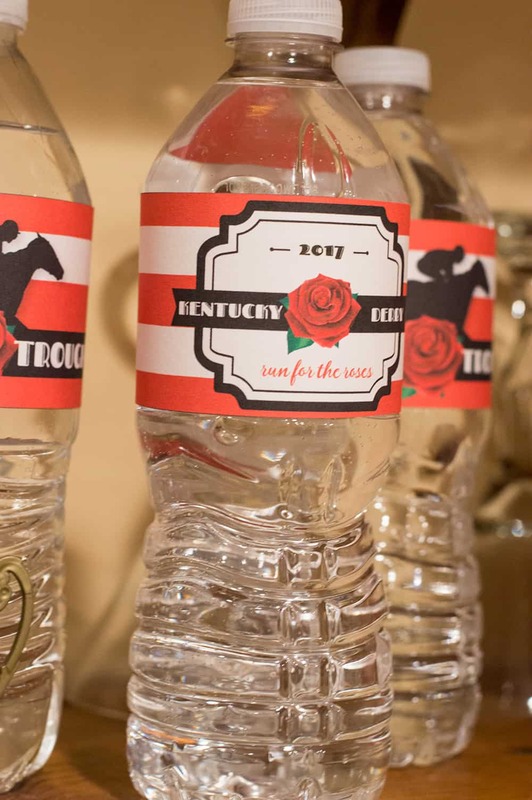 It’s not a bad idea to have some water on hand, and why not wrap them in cute labels to pull the party theme in? These have now been updated to use any year! Download the entire set or choose your items individually. 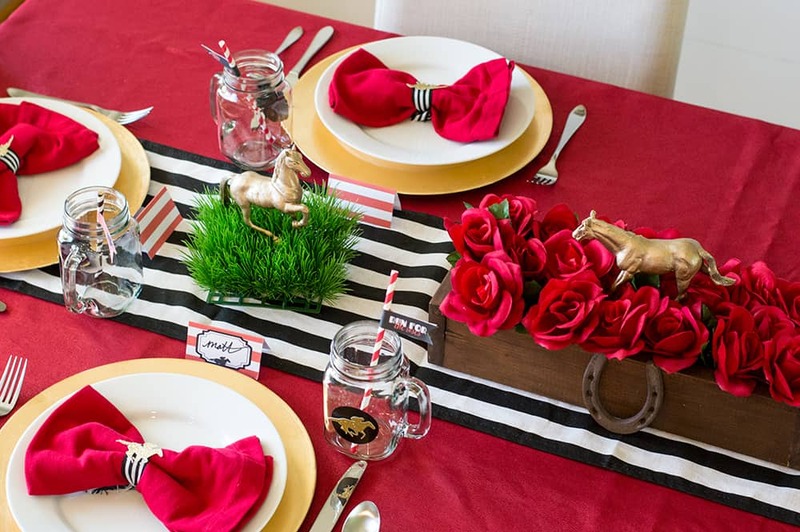 Hope you enjoyed this Kentucky Derby Party using traditional red roses and pops of black and gold for a dramatic style. 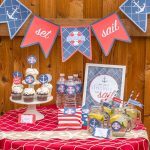 We had a ton of fun putting this party together, and are excited to share these free printables with you to style your own event. If you use these, I would love to see how you style them. Please tag me on Instagram (@elvamdesign) and use hashtag #elvamdesignstudio. 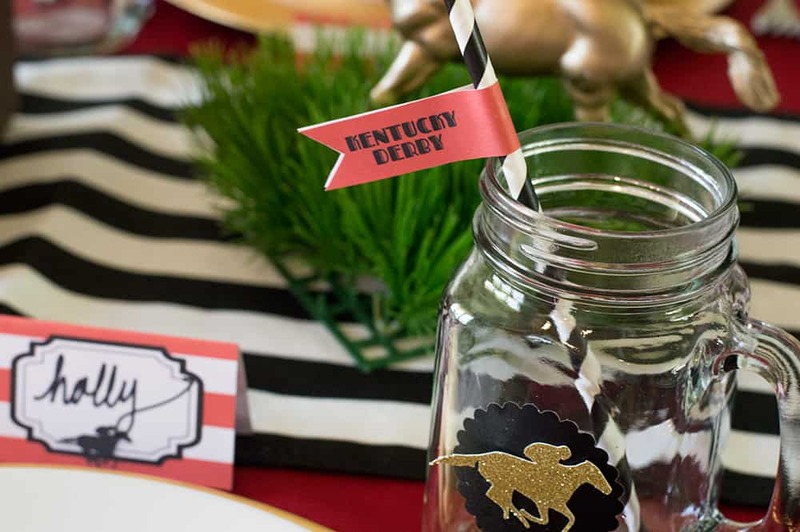 Don’t forget to check out Holly’s post over on Legally Crafty Blog to see what she has to say about this Kentucky Derby event. It was such a delight to collaborate with her on this event. She’s definitely one to follow.